Samford students in biology professor Betsy Dobbins’ Biological and Environmental Perspectives in Community Health course blended learning and service in Perry County during the university’s January term. The students studied issues of waste, as well as water delivery, cleanliness and contamination in the region. 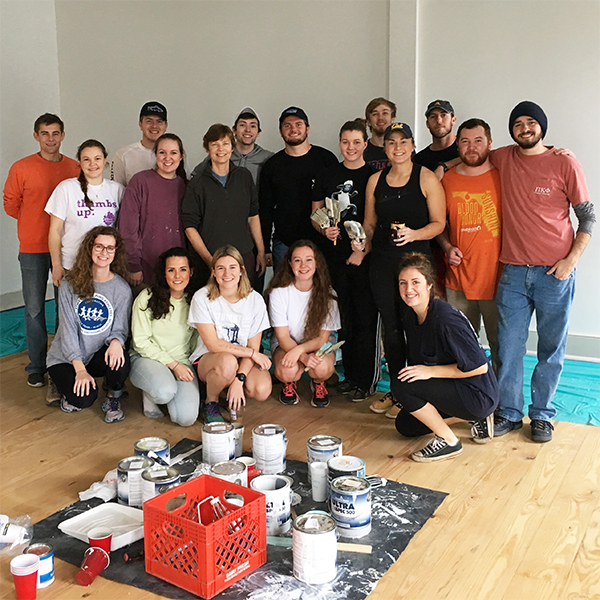 They also joined with student Fellows of Project Horseshoe Farm to paint that community service organization’s new facility in Greensboro. In addition to offering community-based leadership development and K-12 tutoring, the organization runs an innovative network of support programs for adults. The work reflects Samford's ongoing engagement with the region of Alabama where the university was born, and where protracted poverty has led to a host of problems. Long concerned with water quality issues, Dobbins joined with public health faculty member Rachel Casiday to design a new interdisciplinary community-based learning course focused on Alabama’s Black Belt. They led student in the course this summer as a collaborative effort between their academic divisions, Samford’s Frances Marlin Mann Center for Ethics and Leadership, and Judson College.